This essay looks at the development of the roads and bridges in the Town of Champlain. After the Town of Champlain was founded in 1788 and elections held in 1789, a town highway commission directed that roads and bridges be built and maintained. Early roads grew out of foot paths between a few scattered log cabins. By the early 1800s, the town was growing and many roads had been built. In 1805, the State Legislature established the Great Northern Turnpike Company which planned to build a turnpike from Albany to Montreal through Champlain (Prospect Street). The essay will also look at the first wooden bridges built in town starting in 1794. The first iron bridges were built in town starting in 1871 and many were damaged by ice jams on the Great Chazy River. The growth of the Town of Champlain’s roads, highways and bridges is difficult to follow. In Champlain’s earliest days, roads grew out of foot paths between a few scattered log cabins. As more settlers came to town, common footpaths became established dirt roads. After the town’s first elections in 1789, a town government was formed and a highway commission was created with elected commissioners. Roads and bridges were now built using the taxes assessed in town or from money allocated by the state legislature. This essay attempts to show the evolution of the roads and bridges in Champlain Town, albeit incomplete, over the past 230 years. Pliny Moore traveled to Champlain from Kinderhook, N.Y. in 1785 and 1786 to survey his 11,600 acre land grant called the Moorsfield Grant or Smith and Graves Patent. The first time he came to this area, he traveled through Vermont as there were no roads to Canada on the west side of the lake. In May of 1788, Moore and his team of workers and settlers rowed up the Great Chazy River to build a sawmill that would today be along the Perrys Mill road a few miles west of the Village of Champlain. The permanent settlers included blacksmith Caleb Thomas, William Beaumont, Samuel Ashmun and brother-in-law Elnathan Rogers. The interior to Champlain Town was completely unsettled when Moore arrived. Over the next five months, Moore’s workers would help him build a sawmill as well as build their own log houses. Moore also built a hut on the Chazy River where the former First National Bank building is today (at the Elm Street bridge). A year later, he built a frame house on the hill where today’s Clark Funeral home is. Samuel Ashmun built a hut and eventually a house on lot 32 on present day Oak Street just north of the village. Elnathan Rogers lived south of today’s village on lots 72 ad 73 off of today’s Rt. 9. On November 8, 1788, after a summer of working in Champlain, Moore drew a map of the foot paths that connected the sawmill and settlers’ huts. This was the first map showing the roads in Champlain. Most astonishing is that most of the paths he drew have become the roads we travel today. Moore’s map clearly shows the sawmill and other huts (perhaps a blacksmith shop) on the road to Perrys Mills (see map at Location 1). A path leads east towards the village of Champlain and passes two more huts that were probably built by William Beaumont and Caleb Thomas (Locations 2 and 3). At Location 4 is the hut of Samuel Ashmun. Moore’s drawing clearly shows a straight line down to his hut at the river at Location 5. This path later became Oak Street and ran on the edge of lots 46 and 47 (even in 1797 this road was referred to as a “bush road”). From here, the path runs south from the village to Elnathan Rogers’ hut at Location 7 now on Route 9. A path leads from this house to the river rapids at Location 6 but no roads exist today along this route. So Moore’s map shows the beginnings of Oak Street, the east half of Main Street and the State Road (Route 9). In 1797, Elias Dewey and his small family came to Champlain. He sailed from Whitehall to Rouses Point in the sloop called “Drowning Boy.” When he arrived on the lakeshore, he used oxen to haul his household items to his lot. Today, this location is at the intersection of Prospect St. and Route 276. There may have been an overgrown path to his property from Rouses Point but he is said to have cleared this path and made a permanent road. Today this would be the road that runs from Dewey’s Tavern, past the golf course to Rouses Point, also known as Prospect and Chapman Streets. Prior to 1811, this was the only road that ran from Champlain to Rouses Point. Dewey built a log cabin in 1797 and then built his frame house in 1800. Both structures still stand and are owned by Louis and Rita Bedard. Today, the Great Northern Turnpike in Champlain is known as Prospect Street. This road was laid out from the “great bridge” on Elm Street, north on Prospect Street to the house of Elias Dewey and then north to the border along today’s Route 276 to the “Great Kings Road” which had recently been built from Montreal to the border through Odelltown. In the early days of Champlain Town, there were only two or three roads that crossed into Canada. By the 1850’s, that had expanded to nine roads as Canada had become a major part of Champlain’s economy. Today, this number has dropped back down to three. Many of the abandoned border crossing roads can be determined by comparing older maps to a modern map. It is fairly easy to determine the route that the American armies took during the three unsuccessful attempts to invade Canada through Champlain. It is more difficult, however, to determine the exact routes the British army took from Canada to Plattsburgh. When Clinton County was organized in March of 1788, the Town of Champlain encompassed the present-day towns of Altona, Clinton, Ellenburg, Mooers and Chazy. There were only a few roads here and no permanent bridges prior to 1793. The only way to cross the Great Chazy River, Little Chazy River or Corbeau Creek was by ferry, wading in low water or by ice. As the town became settled, the need for bridges became critical. 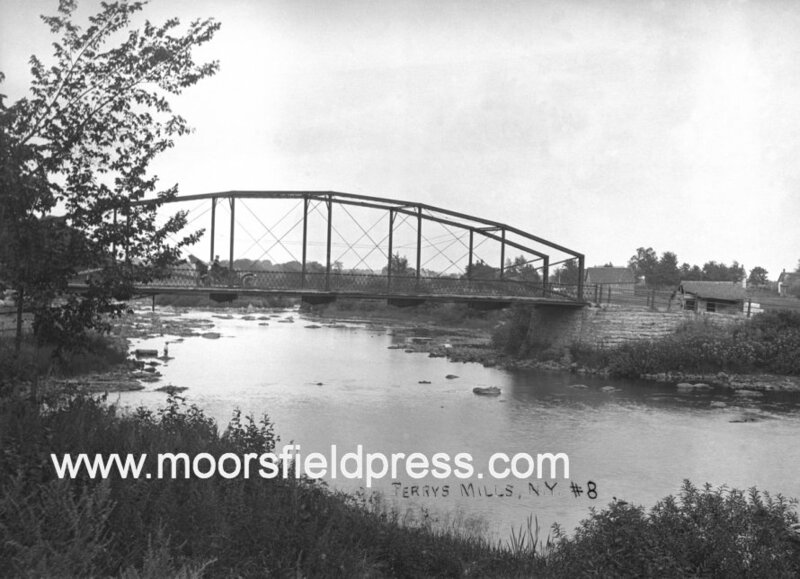 Many bridges have been built in Champlain Town as well as the town of Mooers over the past 218 years. For the first 100 years of Champlain’s history, bridges were prone to destruction from ice and water. The early bridges were built of logs, and starting in 1871, built of iron. Unfortunately, the iron truss bridges were easily damaged by ice and many were swept away. The bridges built in the 1930s and after were considerably stronger and survive today. The northern towns in Clinton County have seen considerable flooding over the years, most notably along the Great Chazy River. Floods (freshets) and ice jams occurred in 1809, 1815, 1835, the 1840’s, 1857, 1886, 1887, 1896, 1904, 1911 as well as other times. Newspaper stories and bridge contracts suggest that the town has had many bridges built or repaired. It is difficult to determine just how many bridges may have existed on the rivers and creeks around town. It is not clear when the Lower Bridge or Elm Street bridge was built but it was likely built during the winter of 1794 after it was approved the by state commissioners. At the time, the area along Champlain’s Main Street was completely unsettled. With the bridge present by 1797, Thomas Fox, who had come from England, built a log cabin near the south end of the bridge at the site of the former Champlain Hall brick building. Afterwards, Amasa Corbin built the first frame house on the flat and operated a store. Charles Lewis Sailly (the son of Peter Sailly of Plattsburgh) also operated a store here. These were Main Street’s first businesses and they could only have flourished after a bridge was built to connect the north and south banks of the Chazy river. The Upper Bridge was for many years only a crude walkway across the Chazy river. Prior to 1811, Pliny Moore built a stone mill on the west bank of the river where Main Street passes over the bridge. This mill building stood until 1876 and was used as a mill, school, jail and barracks for American soldiers during the War of 1812. It is commonly referred to as the “old stone mill”, “clothing mill” or just “grist mill”. In the early days, the only way to cross the river here was on “string pieces” which were hewn timbers tied together and supported by piers in the river. This structure is clearly seen in one of Pliny Moore’s maps. To get their grain ground, people from all over town would come to the mill by way of the Chazy River and unload their boats at the lower bridge where the riverbank gently slopes down at today’s River Street. They then had to haul their grain over the Elm Street bridge, pass through the village flat (downtown Main St.) and cross the precarious walkway to the gristmill. Coopersville was settled as a mill station. Around 1805, Benjamin Mooers purchased lots where the Corbeau Creek empties into the Chazy River. He built a sawmill and gristmill on the Corbeau and this area was referred to as “Mooers Mills” until 1816. Afterwards, Ebenezer Cooper bought this land and built more mills. The area became known as Coopersville and his Federal style house still stands on the south bank of the river by the Route 9B bridge. On March 1, 1815, Benjamin Mooers wrote a letter to Lieutenant Governor John Taylor and asked that the legislature authorize the building of a bridge near his mills. At the time, the only bridge across the Chazy river was in the Village of Champlain. This was an inconvenient location as it required people to travel 10 miles out of their way to get to the other side of the river. Not surprisingly, some people (probably merchants) in the village did not want the bridge built because it would reduce the amount of travelers passing through the village. The same could be said when I-87 bypassed Route 9 and Main Street in the mid-20th century. All images in the 2013 calendar are courtesy the Special Collections, Feinberg Library at Plattsburgh State University College, the Clinton County Historical Association in Plattsburgh, the Samuel de History Center in Champlain or the author. This calendar, with a 15 page historical essay will benefit the Glenwood Cemetery Association of Champlain. It can be purchased at many locations in the Champlain and Plattsburgh areas.